I came to Spain to re-discover my love of Spanish wines. It was back in 2001, when I was doing a study abroad in La Rioja where I tasted a phenomenal wine that changed my life forever. It was then that I decided that I wanted to do something in wine. While the wine was phenomenal, it was truly the experience around the wine that really brought me back to Spain. Recently I was interviewed by the Examiner.com on why I chose to enter the wine industry. When you start talking to the people in the wine industry, you realize that they are the true gems of this industry. I am reprinting the story that was printed in the Examiner. This is the first in a new series to introduce you to interesting people in the wine industry. 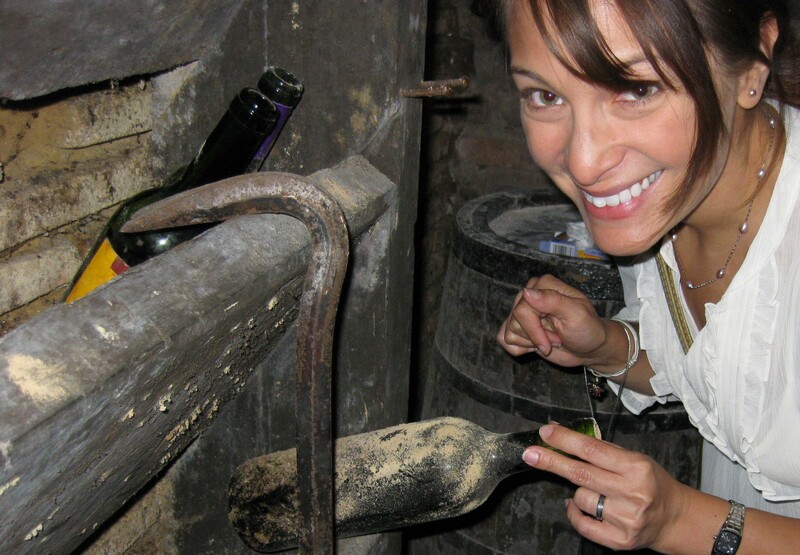 For many, the journey into wine is not only intriguing but often quite an adventure. These talented individuals are what make the wine industry what it is today so follow this series to meet this group of passionate people who have dedicated their lives to wine. April Yap-Hennig: It was during my study abroad in Spain when I was 19. I met a young boy whose father owned and managed a plot of land that he later sold the grapes to Rioja Alta, one of the oldest Rioja wineries in the region. He had insisted on doing a nice dinner together, which we cooked and he brought over a beautiful bottle of a Rioja Alta, which was specifically made from all the farmers from whom they purchased grapes. They then made a special release that they provided only to these vintners, which I was lucky enough to try that night. It was then that I realized what great quality wine is supposed to taste like and it opened my eyes to this industry. The relationship may not have lasted but his impact on the rest of my life did. I studied Communications, more specifically Public Relations in Undergrad. After working for four and half years in Los Angeles in Public Relations, I decided I needed something more, PR was only one part of the marketing mix. I then went on to study at Purdue University and obtained my MBA with a focus in Marketing and Human Resources. It was obvious from the moment I started that Marketing had always been my true calling. I was then recruited to work for Eaton Manufacturing, where I worked for another four and half years in The Netherlands, Germany, and Switzerland. I was the first of their European Marketing Leadership Development Team. These are people they train in multiple areas of the company, Electric, Hydraulic, Truck and Automotive, and Aerospace. They are basically grooming you to be upper management, running the company one day. I loved working for them but my true calling came when I saw the opportunity to return to my beloved and not forgotten Rioja. It came in the form of advertisement for a two year Masters of Science in Viticulture and Enology at the University of La Rioja, in the exact same town, in the exact same university that I had studied in back when I was 19. I applied to the program and the minute I was accepted, my husband and I quit our jobs in Switzerland and moved to Spain. I then went on to help smaller boutique wineries with their marketing and export plans while I went to school. It was such a wonderful time and such a great opportunity to jump into the industry. I knew that in order to get into the wine industry, I had to show the dedication through education in order to break in. I’m not sure the wine industry has particularly changed me as much as I keep wanting to change it. I see so many opportunities that are employed in other industries that could so easily be applied in this industry. It is a matter of taking that leap that I feel sometimes companies, people, are afraid to do. It’s human nature to not want to change but after living in seven different countries and numerous more moves, I know that change can sometimes be the catalyst to something better. Has it changed me? Yes, I’ve become a lot more humble, I will do everything from the most menial of tasks to the most complex and strategic. Generally in the corporate world, you are meant to be one part of the working machine and leave the rest to others to complete. The difference here is that you are part of what keeps that working machine running at full speed, jumping in wherever necessary to help out in any way possible. In many ways, there are benefits to both but being able to wear many hats and then one as needed can give you the skills you need to succeed in any industry. The people, are by far my favorite part of the industry. In particular the original winemaker/owners who have the entrepreneurial spirit to get out there and plant some vines and see what happens. Many of them come from so many different backgrounds such as Foreign Service to Corporate Directors. Many saw this as an opportunity to come back down to earth, play in the dirt, come back to something simpler. I believe in a way, I became a part of this industry for the same reasons. It is not necessarily the most profitable business, so much of it is up to nature to dictate your future. For those that plan ahead and use the tools and skills available to them, they succeed but I can say it is never easy and it can be very hard to be profitable. My second favorite, the availability of so many different types of wine. I got into this industry for the wine, the passion of it, the passion of people behind it and the culture that goes with it. I find it fascinating that a single cluster of fruit can become a multi-million dollar industry in the world. In the end, it’s a grape. But it evolves into something so delicious and delectable that it’s stirs passions in more than just a few people. Wine is a passion of mine and I hope I can have as much of an impact on the industry as it has had on me. Now I am looking for my next adventure in Oregon!